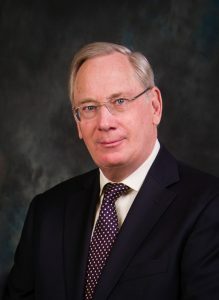 The Duke of Gloucester is the second son of the late Duke of Gloucester and Princess Alice, Duchess of Gloucester (third daughter of the 7th Duke of Buccleuch). He is grandson of George V and a first cousin to The Queen. Born on 26 August 1944 at Northampton, he was christened Richard Alexander Walter George. In 1963 after Eton, Prince Richard went up to Magdalene College, Cambridge, where he read architecture. He had planned a full time career in architecture, but following the death of his elder brother, Prince William of Gloucester, in a flying accident on 28 August 1972. He became his father’s heir and took on increased royal duties and the responsibility for the family estate at Barnwell in Northamptonshire He succeeded his father in June 1974. The Duke of Gloucester is still deeply interested in architecture and conservation and has also produced three books of photographs: On Public View (1970) which illustrated London statues; The Face of London (1973) and Oxford and Cambridge (1980). In July 1972 Prince Richard married Birgitte van Deurs. The Duke and Duchess of Gloucester live at Kensington Palace and have three children, (Alexander) Earl of Ulster (born 1974), The Lady Davina Windsor (born 1977) and The Lady Rose Windsor (born 1980). None of the children carry out official royal duties. The Duke of Gloucester carries out many public duties – he acted as Counsellor of State for the first time in 1966 on the occasion of The Queen’s Caribbean Tour and he is The Queen’s Trustee of the British Museum. The Duke holds honorary military appointments with the Royal Gloucestershire Berkshire and Wiltshire Regiment, the Royal Logistics Corps, the Royal Monmouthshire Royal Engineers (Militia) and Royal Air Force Odiham. Following his father, he is Grand Prior of the Order of St John. The Duke of Gloucester was appointed a Knight of the Order of the Garter (KG) in 1997. He was appointed a Knight Grand Cross of the Royal Victorian Order *GCVO) in 1974. He received the Grand Cross of the Order of St Olav from the King of Norway in 1973 and the Royal Order of the Northern Star from the King of Sweden in 1975.